ARLINGTON, Texas — The Red Sox made John Lackey their No. 2 starter with the belief he was headed for a strong season, an assertion manager Terry Francona repeated before the righthander took the mound against the Texas Rangers last night. “I think he’s primed to have a solid year,’’ Francona said. That may prove to be the case, but the start of his season was a disaster. Lackey gave up nine runs and could not get through the fourth inning as the Red Sox were rocked, 12-5, before a crowd of 48,356 fans. The Sox have allowed 21 runs on 25 hits, 15 for extra bases (including seven home runs), in two games. They are 0-2 for the first time since 2005, and will try to avoid a sweep this afternoon with Clay Buchholz on the mound. Lackey has pitched against Texas more than any team. Last night was his 34th start, the 17th at Rangers Ballpark in Arlington. Perhaps he should duck the Rangers down the road. He is 11-13 against them with a 6.07 ERA. “You just have to wipe this one away,’’ said Lackey, who may not get a warm reception on Friday when he starts the home opener against the Yankees. The one bright spot for the Red Sox was David Ortiz, who hit his second home run in as many games. He had three RBIs on the night, giving him a major league-record 1,004 as a designated hitter. Edgar Martinez had held the mark of 1,003. The second game of the season started much like the first as Ian Kinsler gave Texas a 1-0 lead with a leadoff homer. He connected off Jon Lester Friday and Lackey last night. Perhaps Buchholz should take no chances and hit Kinsler with a pitch this afternoon. Kinsler is the first player in major league history to lead off the first two games of a season with home runs. The Sox had not allowed leadoff home runs in consecutive games since June 3-4, 2002, when Ramon Santiago of the Tigers connected against Pedro Martinez and John Burkett. Ortiz, who spent spring training piling up at-bats in hopes of avoiding a slow start, homered in the second inning, a two-run shot. With Adrian Gonzalez on after a single, Ortiz drove a belt-high fastball from Colby Lewis over the wall in right. Ortiz did not hit his second home run last season until May 1. In 2009, his second did come until June 6. Lackey gave the lead back in the third inning. Kinsler doubled to the gap in right and scored on a triple by Elvis Andrus, the ball rolling to the same spot. Josh Hamilton followed with an RBI single. The Sox tied it in the fourth. Gonzalez led off with a single to left and took third when Kevin Youkilis doubled down the line in left. Ortiz came back from an 0-and-2 count and grounded to first, scoring Gonzalez. But Youkilis was stranded at third when J.D. Drew grounded to first and Jarrod Saltalamacchia struck out looking. The fourth inning was a nightmare for Lackey as Texas scored six runs on five hits, four for extra bases, all with two outs. Yorvit Torrealba started the rally that sent New Englanders to bed in droves with a double. Julio Borbon followed with a triple to the corner in right. After Kinsler walked, Andrus doubled to center as Jacoby Ellsbury’s dive was in vain. Borbon scored. The Sox then intentionally walked Hamilton, who was 11 for 23 against Lackey to that point. That brought up Adrian Beltre, who was 9 for 52 (.173) against Lackey. Beltre, who drove in 102 runs for the Red Sox last season, drove in his first four of this season with a blast that cleared the wall in left. 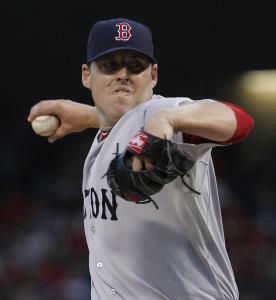 After Lackey gave up a single to Michael Young, that was it for him as the Red Sox trailed, 9-3. “I was trying to go fastball in [against Beltre] and left it over the plate,’’ Lackey said. The seven extra-base hits were the most Lackey has allowed in a game. It was the third time in 268 career appearances that Lackey has allowed nine or more earned runs, the second time against Texas. Relievers Dan Wheeler and Tim Wakefield allowed three more runs. Lewis went six innings, allowing three runs on six hits. Ellsbury homered off Mason Tobin in the seventh inning. The two-run blast broke a streak of 134 at-bats without a home run for Ellsbury, dating to Sept. 20, 2009.